NOTTINGHAM, NH--(Marketwired - Dec 8, 2015) - GenTent® Safety Canopies and Cabela's, the world's foremost outfitter, today announced Cabela's has become a certified dealer of GenTent safety canopies. Additionally, the companies established an exclusive Cabela's GenTent Gold Fit Concierge Service to confirm perfect fit on the customer's generator prior to shipment. As a certified online retailer, Cabela's is offering a full range of GenTent 10k products on its popular website. Based in Sidney, Nebraska, Cabela's Inc. is a direct marketer and specialty retailer of hunting, fishing, camping, shooting, and related outdoor recreation merchandise. As part of the Cabela's GenTent Gold Fit Concierge Service, GenTent will support each Cabela's customer with a direct call from a sizing agent to ensure a proper fit of each GenTent prior to shipment. "GenTent's safety canopies are a perfect complement to our broad range of portable generators," said Carl Hausmann, Cabela's power sports category manager. "We are proud to offer our customers this innovative solution that allows our outdoor customers peace-of-mind for safe operations and investment protection of their inverter and portable generators in nearly any wet weather." Portable generator products represent a growing segment of Cabela's online retail business and include a wide range of products from companies such as Champion Power Equipment, Generac, Yamaha, Polaris, Powerhouse, and Cabela's branded portable generators and inverter generators. "As the company that established the Generator Tent category, we're delighted to expand GenTent's availability to Cabela's broad customer base," said Mark Carpenter, CEO and Founder of GenTent Safety Canopies. "This agreement enhances Cabela's offerings with an easy-to-use solution to keep their customers safe and keep their inverter or portable generators operating in wet weather while camping, RVing, tailgating, at outdoor events, as well as emergency backup." GenTent Safety Canopies for both emergency backup and outdoor enthusiasts are available for ordering now at Cabela's online site. Established in 2011, GenTent® Safety Canopies are easy-to-install weatherproof covers that ensure safe operations of portable generators in virtually any wet weather conditions while keeping the generator portable. The GenTent reduces CO poisoning or electrocution risks by enabling portable generators to safely operate outdoors away from structures during wet weather. Installation is a simple 3-step operation -- Clamp it, Frame it and Cover it -- to "Weatherproof Your Power"™. The company's patented, portable generator safety canopies are Made in the USA and relied on by the National Guard as well as homeowners and businesses during such notable storms as SuperStorm Sandy. 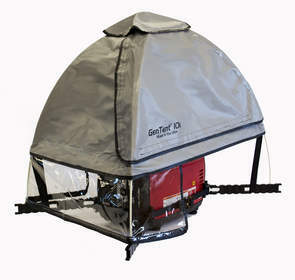 GenTent is considered the premier safety canopy for portable generators operated by the National Guard, RV owners, tailgaters, campers, homeowners, businesses and first responders. For more information visit: http://www.gentent.com/. Cabela's has become a certified dealer of GenTent safety canopies with an exclusive Cabela’s GenTent Gold Fit Concierge Service.